Dr. L. King Scott and his team understand that your days are long and busy. Between work and school, family and friends, there hardly seems to be enough hours in the day to get everything done. And by the end of the day, all you want is your comfy bed and soft pillow. There is, however, one more important thing you have to do before your go to bed. Your nightly oral hygiene routine is critically important not only to your oral health, but your general health, too. And that routine must include flossing. Brushing your teeth alone does not remove the plaque that can build up between your teeth throughout the day. 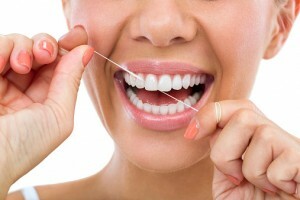 Proper flossing helps to remove this plaque, which if left to accumulate can lead to gum disease and systemic ailments. Plaque is that sticky substance that naturally develops in our mouths throughout the day. But just because plaque is natural doesn’t necessarily mean that it’s good. Hiding inside plaque is the bacteria that cause gum disease. Whether gingivitis or the more advanced periodontitis, gum disease is often marked by swollen and bleeding gums. And if gums are bleeding, then bacteria have an entrance to the rest of the body through the bloodstream. Systemic conditions that have been linked to gum disease include high blood pressure, stroke, cardiovascular disease and low birthweight in newborn babies. Brushing your teeth only removes plaque that accumulates on the surface of your teeth. Flossing, on the other hand, is designed to remove plaque from between your teeth. Let’s review the proper techniques for flossing, so you perform this important task effectively. Cut off approximately 18 inches of floss and wind the majority evenly around both of your middle fingers. Leave about two inches in between that you can grasp with your forefingers and thumbs. Gently guide the floss between a pair of teeth. Where you begin is up to you—just be sure to floss between all of your teeth. Pull the floss against one tooth and move it up and down and back and forth, taking care to floss all the way to the gum line. Then, pull the floss against the other tooth and floss. As you progress from one pair of teeth to the next, be sure to advance the floss by taking up floss on one finger from the other. This way, you’ll be flossing with a clean stretch each time. Whether you floss and then brush or brush and then floss is less important than making sure you floss each and every night. Whatever your preference, be sure to rinse your mouth with water or a dental mouthwash after you floss. In addition to brushing and flossing your teeth with care, dental checkups are important, too. If it’s time to see Dr. Scott, then call our office today. Dr. Scott and his staff happily provide dental services to those who live in Monroe, LA, Ruston, Rayville, Farmerville, Columbia, South Arkansas, and the greater North Louisiana area.